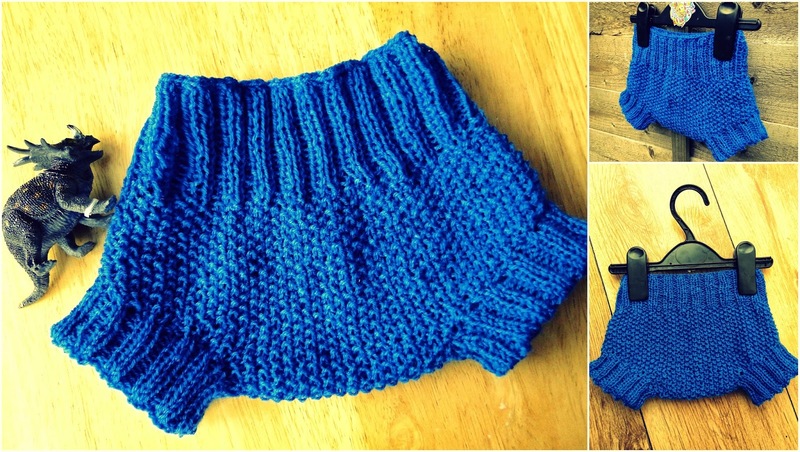 The knitting should be loose and soft because wool felts up with wear, causing the diaper cover to shrink slightly. Before starting to knit the actual garment, knit a swatch and adjust your knitting gauge to correspond tothat of the pattern. A wool diaper cover is worn over a regular diaper. A reusable diaper cover is easy to make. Rows 1-13: K2tog, K1, P1, when 2 sts left, K2tog. After decreasing you ar eleft with 20 sts. Row 2: P1, K1 to end of row. Repeat rows 1-2 nine times (18 rows). When reached 38 sts, then cast on 1 st to every end and beginning (add 2 sts per row) until reached 48 sts (5 rows). Sew both sides together and start legs. Collect 48 sts on circular needle. Rounds 1-10: K2, P2 to end of round. Round 11: Purl to end of round. Rounds 12- 21: K2, P2 to end of round. Fasten off. Do second leg the same way. Fold in half and sew both ends together. The wool diaper cover needs to be washed about once in three weeks, in addition to regular airing after use. You can add a drop of white vinegar in the final rinse water in order to soften the garment. This written pattern and photographs are copyright and are the express property of the author. Do not sell, transmit, publish or pass on this publication (in printed or electronic format). Very cute. I will make for my grandsone. Copyright 3 Rabbits Patterns. Powered by Blogger.